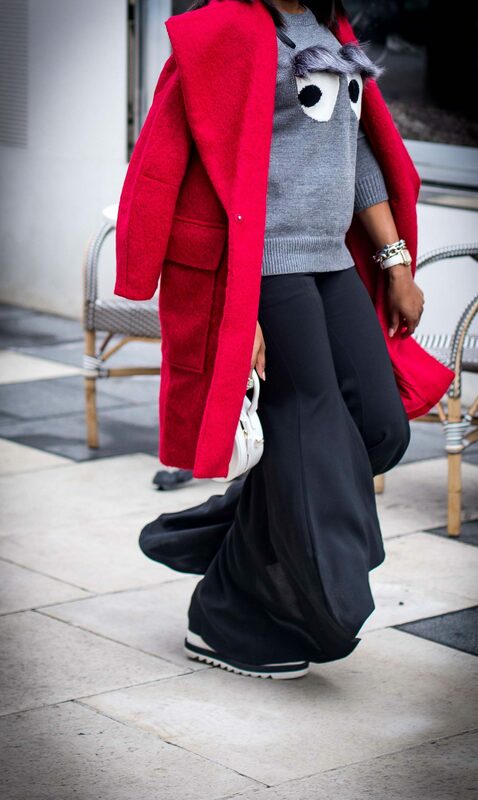 flare pants and how to style them during the winter. 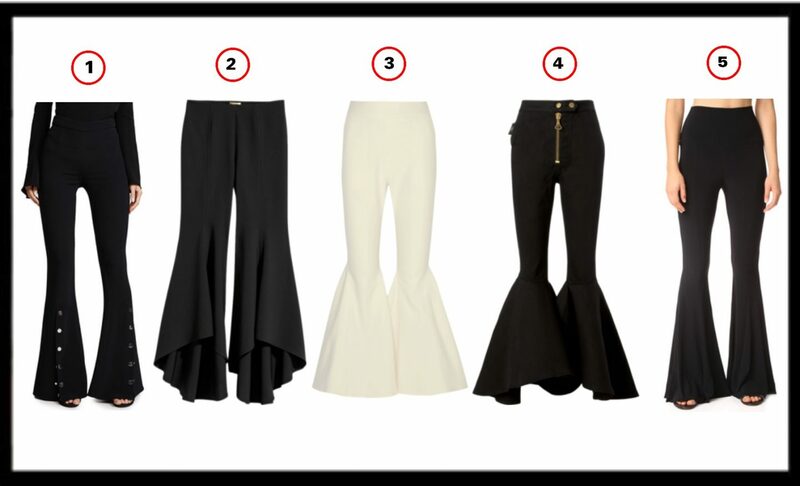 A pair of flare pants can be a little intimidating because of it’s extravagant silhouette. Have no fear because in today’s post I show you a stylish way to wear the trend. These exaggerated wide-leg pants are dressy by nature, and do a great job of dressing up your outfit of the day. This style of pants also look excellent with high-heels, as the heels tend to elongate the body. To give the pants a stylish flare, I paired them with fun casual pieces. To create the perfect style twist I opted for a pair of high-heel platforms instead of a pair of stiletto heels. 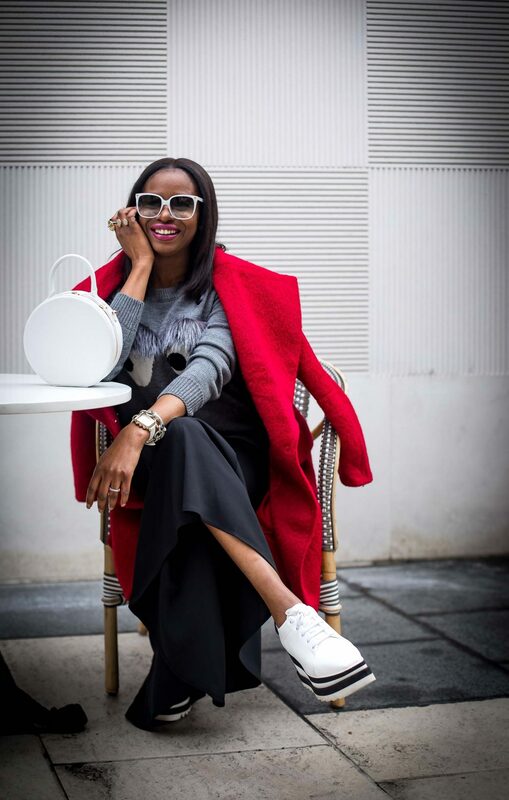 The shoes determine the direction of the look hence the outfit becomes casual and fun after introducing the sneakers to the look. White sunglasses, and a white bag add interest to the overall outfit, giving it a more modern vibe. My animated sweater also compliments the sneakers, and all the other details. The sweater does a great job of tying all the pieces together. Lastly the red coat infuses one of the hottest colors of the season, and adds interest to my stylish outfit of the day. 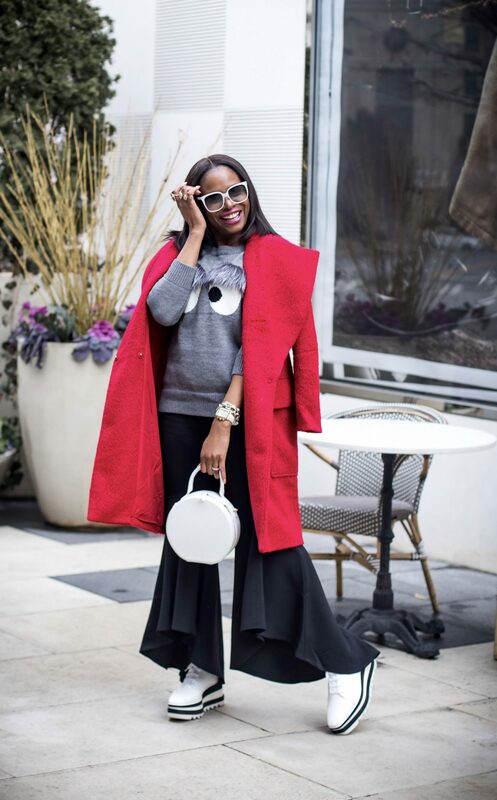 Step outside of your style comfort zone and buy a pair of flare pants this season. 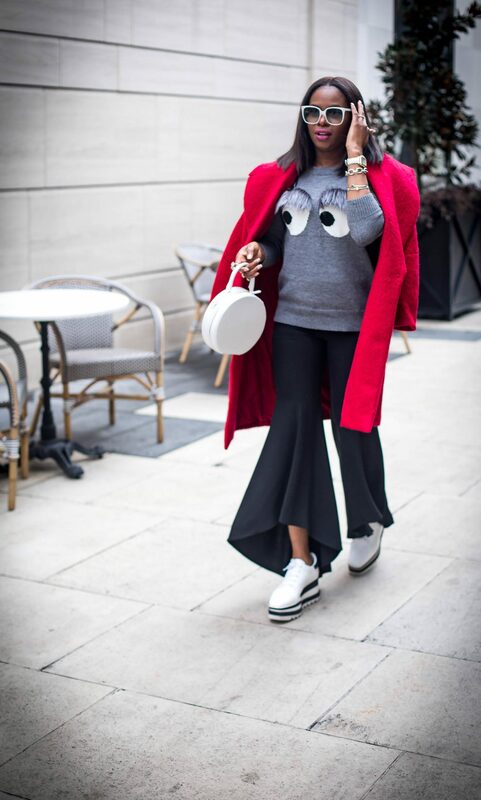 The key to making this trend work right now is pairing your pants with stylish sweaters or tops and heels. Because the pants are fitted from the waist to right above the knee you want to make sure you add height when wearing flare-hem pants. If you wear these pants with flats, it will make you look short and stumpy. When styling your pants, make sure the volume at the bottom is balanced with the volume at the top, hence you should marry the pants with tops that are not too fitted. By creating the right balance of the top and bottom you will create the perfect outfit of the day.